Definition: Communication is the process of transmitting information from one person to another. It is the act of sharing of ideas, facts, opinions, thoughts, messages or emotions to other people, in and out the organisation, with the use of the channel to create mutual understanding and confidence. It is not tied to words, i.e. whether an individual speaks or not, the message is automatically conveyed to the other party. Besides words, communication can take place through symbols, letters, actions, expressions, etc. Sender: Otherwise known as a source, it is the person who has something to pass on, to another individual. Encoding: The sender of the message, selects appropriate words or non-verbal techniques to convert the idea into the message, which is called as encoding. Message: Message implies something that the sender wants to communicate, to the receiver. Without a message, no communication is possible. Medium: Medium alludes to the channel or mode, through which message is communicated to the receiver, i.e. it can be sent by way of electronic word processing system, graphic, symbol, etc. Receiver: The one to whom the message is directed, is called receiver. He/she notices and conveys some meaning to the message. Decoding: The act of interpreting message by the receiver, is termed as decoding. The receiver’s outlook, experience, and attitude play a vital role in decoding message. Feedback: The process of communication can never be completed, if the response of the receiver is missing. It enables the communicator of a message to know whether the message has been received and interpreted in the same manner as directed. All the seven elements of communication has a great role to play in the entire process, as there can be some deformation between the intended message and the received one. Horizontal: Between employees of the same level, but different areas of responsibility (department). Diagonal: Between employees of different levels and department. 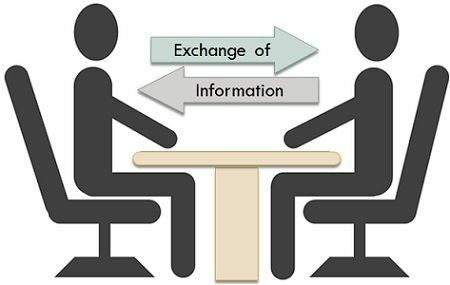 Informal communication is the fastest form of communication, that rapidly transmits information to various members of the organisation. Further, the response of the members can also be obtained quickly. Oral communication: E.g. Face to face conversation, telephonic conversation, lectures, speeches, conferences, etc. Written communication: E.g. Letters, emails, newsletters, SMS, etc. Body language, E.g. Gestures, postures, body movements, etc. Paralanguage, E.g. Pitch variation, tone, speaking speed, word stress, etc. Sign language E.g. Hand movement, facial expressions, etc. Time language E.g. time used to communicate our message. Space language, E.g. Space maintained between the parties to communication, during the conversation. Communication is the spine of the organization that without it no organisation can survive and operate effectively, towards attaining its goals. It is the primary means, by which organisational members work together. Further, it ties all the members of an organisation in a single thread and let them respond to and influence each other.